When a ship has been decommissioned and it’s time to recycle its parts, it make go to a ship breaking yard for demolition. It’s spectacular to watch, but it’s also remarkably tough and dangerous work for the workers who break down the boats piece by piece and haul them away. 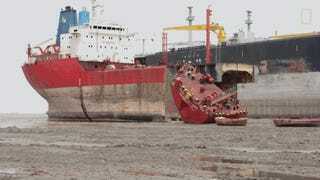 In the recent years, ship breaking facilities were moved from the UK and the United States to Asia because of lower labor costs and environmental standards, and most of the work is done through traditional methods instead of with modern machines. There are serious environmental and health risks, because some ships older than 30 years could contain asbestos and other chemical compounds, and there are also dangerous fumes from burning materials. The workers do their work without any protective equipment. Demolition of huge ships in Bangladesh, where the bulk of the world’s ship breaking is done, thanks to low environment standards and cheap labor. The workers (some of them are children) are exposed to toxic gases, pollution and the threat of being crushed or stabbed by large slabs of steel, and are paid a half a dollar a day.